Is your town plagued by potholes? Let Domino's Pizza know! 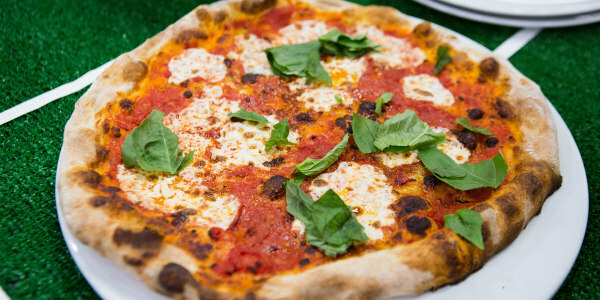 “We don't want to lose any great-tasting pizza to a pothole, ruining a wonderful meal." Would you like your pizza with a side of pavement? Domino’s is dead set on making sure customers get home with their pizzas intact. Not only do they have a guarantee that if a customer damages their pizza before they make it home, the company will replace it for free, but now, they’re making sure potholes can't destroy the pie either. As part of the company's Paving for Pizza initiative, Domino's is helping cities tackle the plethora of potholes that remain after the snow and ice from last winter, so a big bump doesn’t send a pizza flying on its way home. “We don't want to lose any great-tasting pizza to a pothole, ruining a wonderful meal," said Russell Weiner, president of Domino's USA, in a company press release. The pizza company has introduced a website to take nominations for towns that need help paving potholes. Domino’s has already worked with four cities, including Burbank, California, and Athens, Georgia, providing funding to repair potholes. At first, it sounded gimmicky, sure, but the company has actually helped pave more than 200 potholes to date, with Athens, Georgia, getting the most at 150. Paving potholes isn’t cheap. In Buffalo, New York, for example, it’s estimated to cost $10 million to repave 100 streets. So it’s no surprise these towns are pretty pumped about the extra help. “We appreciated the extra paving for pizza funds to stretch our street repair budget as we addressed more potholes than usual,” the city manager of Milford, Delaware is quoted as saying on the Paving for Potholes website. Citizens who feel their city is plagued by potholes can submit their zip code for consideration by Aug. 31, 2018 at Paving for Pizza. A spokesperson for Domino’s told TODAY Food by email that 20 grants will be awarded after review of the submissions and gauging the interest of municipalities in receiving the grant. It is not disclosing the total amount of each grant at this time. Domino’s also recently announced they’ll deliver pizza to locations that don’t have traditional addresses like parks, beaches and sports venues. And they even introduced a baby registry, so new parents can have a pizza delivered to them when they may be too tired to cook. Which is great and all, but unfortunately, a pothole could stop any of those deliveries from happening.